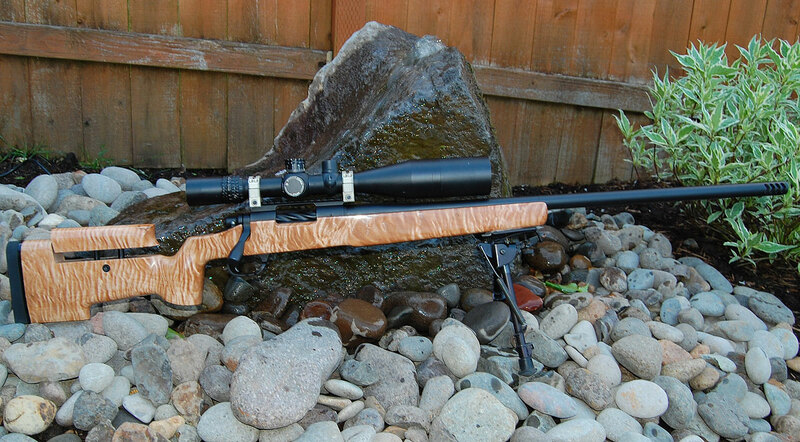 Forum member Cody H. (aka “Willys46″) provided this report on his new Russo-stocked 6-6.5×47 Rifle. Joel Russo out of Harrisburg, PA is taking modern technology and new stock designs and mating them with Old World materials and craftsmanship. The result: rifles that shoot true and look seriously sharp. 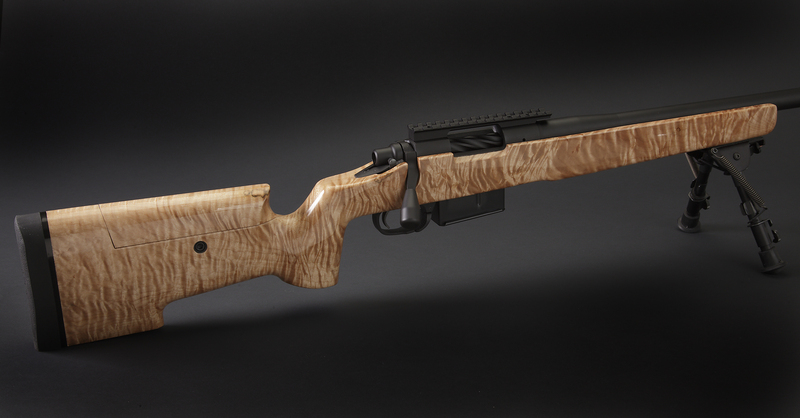 Russo got his start making laminated wood stocks for budget-minded tactical rifle shooters with his popular A5-L design. 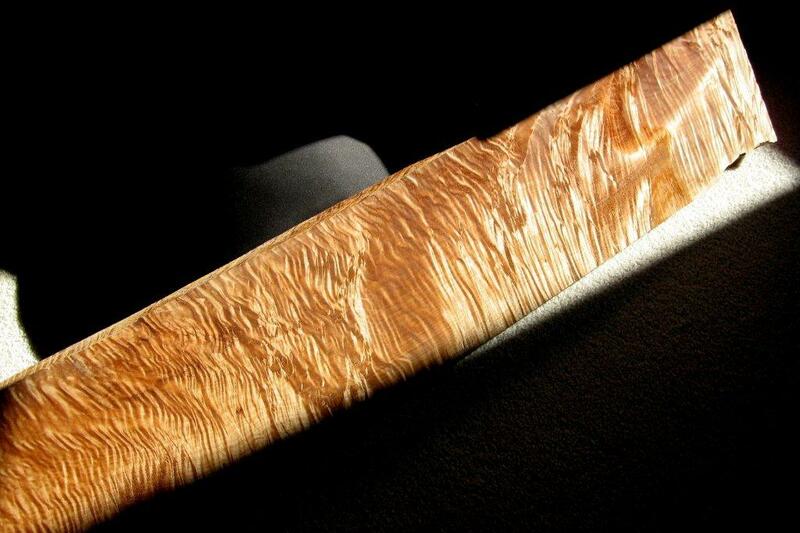 Motivated by his passion for woodworking and a mindset for detail, Russo has shifted his focus from the run-of-the-mill laminates to create shootable works of art in some of the most highly figured, beautiful, exotic and domestic woods. Russo has come to feel that if he as a craftsman is going to spend precious time creating something out of wood, it should be for something worthy of his personal investment. Take, for example, a recent Russo stock that started its life as a highly figured piece of Curly Maple harvested in the Pacific Northwest. After CNC inletting, profiling, pillar- and glass-bedding, the stock was meticulously finished to showcase the wood’s beauty. 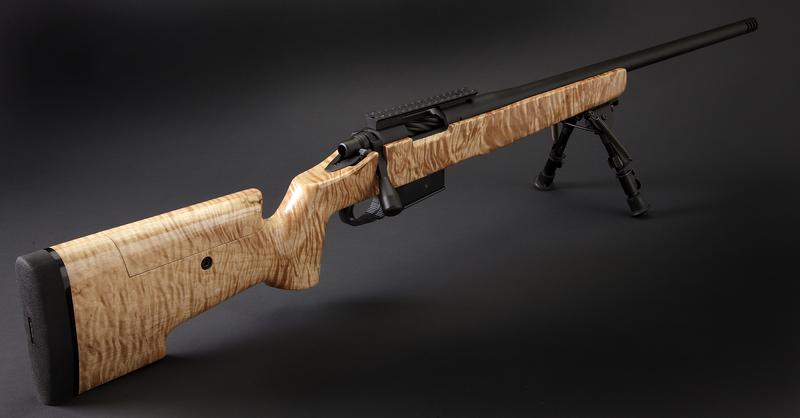 This stunning stock was commissioned for my new 6-6.5×47 Precision Field Rifle [Editor: it’s just too pretty to be labeled ‘tactical’]. Have a look…. 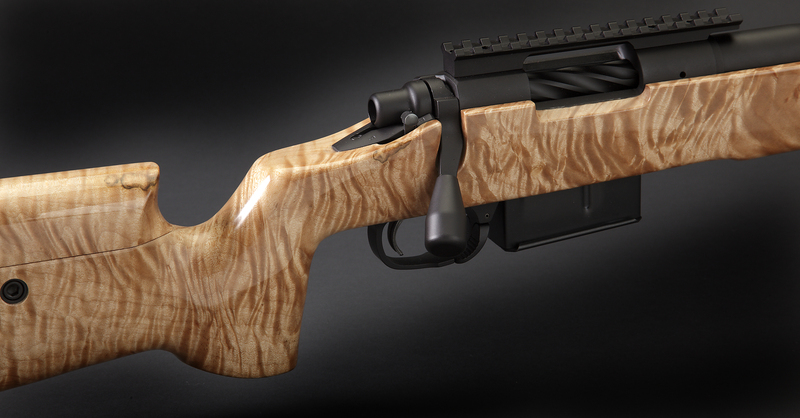 Rifle Specifications: Remington 700 short action with R&D Precision bottom metal. Bartlein Barrel (Sendero Contour). 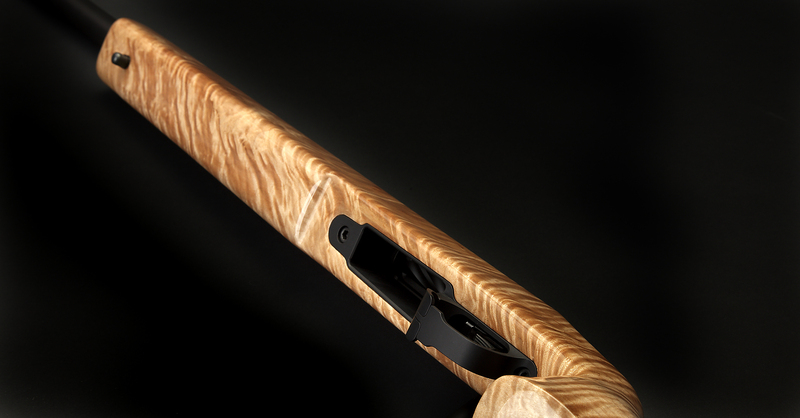 Joel Russo Stock in A3-5 pattern (A5 buttstock with A3 fore-end). Barrel chambering/fitting (6-6.5X47 Lapua) by Steve Kostanich. NOTE: Hi-Rez Gallery images may take some time to load. Be patient — it’s worth the wait. Like any artist, Russo carefully considers where to begin. Deciding where the stock will be cut out of the wood blank can take days. He must determine where the forend and pistol grip will lay to be sure the true beauty of the wood will transfer to the stock design. After Russo cuts the rough pattern out of the blank, it’s off to the CNC mill for barrel and action inletting. The stock is almost completely inletted but still in the rough; enough material remains for Russo to hand-blend the wood and metal for that all-important fit and finish. Then it’s off to the duplicator, which cuts out the stock in the specified pattern. With inletting completed, the action is pillar- and glass-bedded, then readied for final shaping. The tang/pistol grip area demands careful work for a perfect look and feel. It takes hours with files and rasps to get everything just right. Once material is removed it’s a done deal so patience with the tools is a must. Russo is a very painstaking woodworker, and as an artisan and champion shooter himself, he wants the tang to melt into the pistol grip for the perfect look and feel. Once the major wood removal is complete, Russo begins surface sanding. To make the finish come out smooth and flat, a sanding block is a must. With the density change in figured wood, some sections will be softer and so material is removed more quickly, making for a very wavy finish. When Russo is satisfied with the final sanding he starts the finishing process. Russo generally does a hand-rubbed TUNG Oil finish. Since this stock is for a tactical competition rifle, and I wanted to preserve the natural blond color of the Maple, a clear coat finish was in order. In all fairness the maple would look even better with a darker oil finish, which allows the deep grain and figure to come out, creating an almost 3-D effect. A hand rubbed oil finish can take months to be applied properly. The shorter application time was another advantage for this particular build. Clear coat maintains the original color of the wood while being comparatively easy to apply with basic paint-spraying tools. If you scratch the surface, it’s a simple matter to buff it out just like you would a car door ding. After a numerous coats are applied then it is wet-sanded just like the finish on a classic hot rod. The finer the sandpaper grit, the shiner the finish. For the maple stock project, a higher-than-typical gloss finish was selected because the wood kept looking better the shiner it got. Want it shinier? All you have to do is invest a little more time in sanding and polishing. Sometimes Russo works his way to 6000 grit sandpaper. After final wet-sanding of the clear-coat, the finished stock is one even a millionaire would be proud to shoot. With the advent of fiberglass composite materials and assembly-line production methods, there are fewer true craftsmen like Joel who can start with a block of wood and some metal and create a complete rifle. So it’s refreshing that wood artisans like Russo are keeping alive the craftsman tradition. 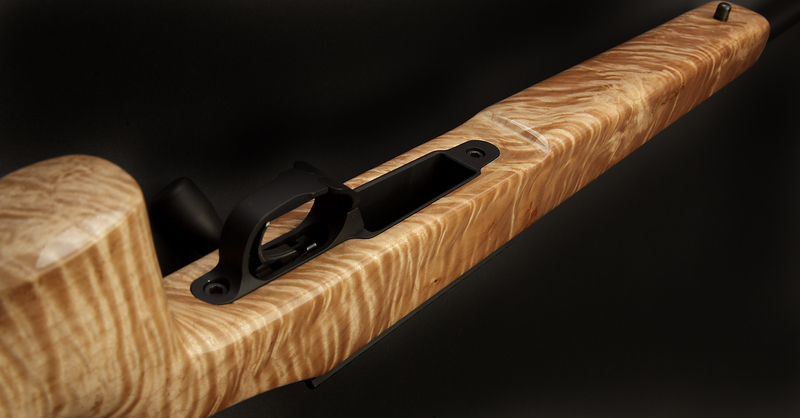 To see more examples of Joel Russo’s work, visit www.RussoRifleStocks.com. 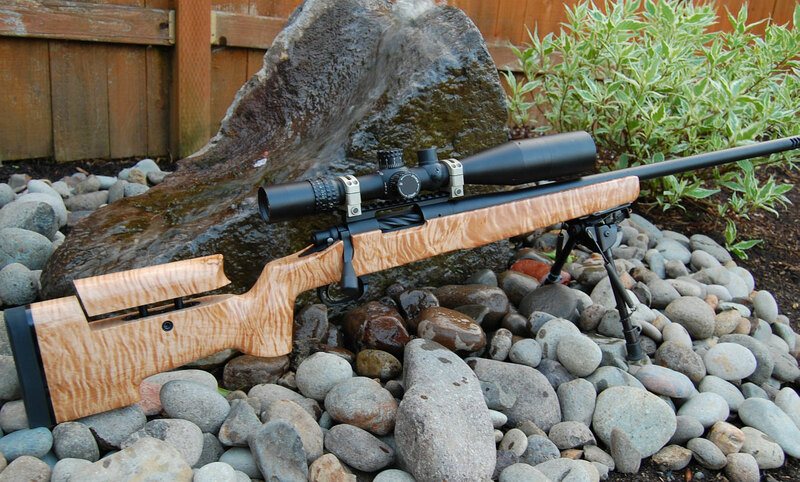 Share the post "Cody’s ‘Glam-Tactical’ Curly Maple Precision Field Rifle by Russo"
As a proud owner of two of Joel’s stocks, yeah the guy is simply a wood artist. Some people have the gift, Russo certainly does! His customer service and attention to detail,is second to none. Thanks for sharing Cody. Beautiful rig. Beautiful wood craftsmanship from Joel Russo! We’ll be competing in the Steel Challenge long-range match in Washington state. I’ll be real proud to shoot alongside Cody (aka Willys46) with his slick new build. 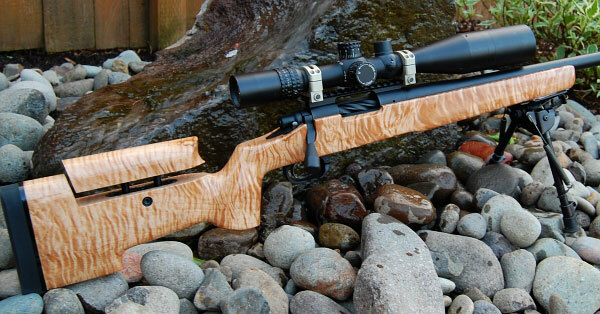 This rifle is sure to draw a lot of attention on the line! Most of us run plain Jane or camo composite tactical or hunting rigs. I use one of Joel’s laminated A5 pattern stocks on my .22LR “trainer” and can also attest to his superior product and customer service. Does anybody know how to get a hold of Joel? I’ve left contact information Russo rifle stocks website twice.